Bentley's stand at this years Geneva show will be a relatively quiet affair with only the new V8-powered version of its Flying Spur the real talking point. 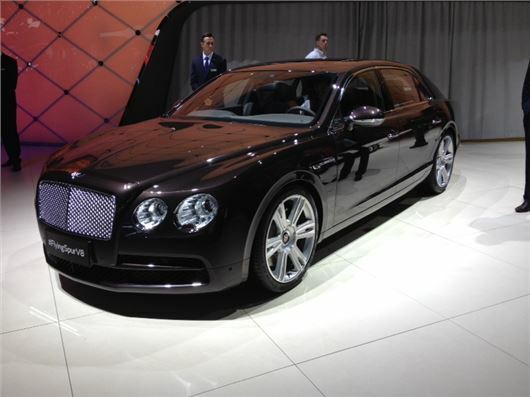 The engine debuted in the Continental GT to much acclaim and now Bentley is fitting it in the four-door Flying Spur. The 4.0-litre V8 comes with twin turbochargers to boost power to 507PS with torque at 660Nm. That gives the big Flying Spur a 0-62mph time of 5.2 seconds and a top speed of 183mph. It will be available alongside the existing W12 model. There are a few styling changes for the V8 models with figure of eight chrome exhausts while the Bentley winged badge gets a red centre to signify that it's a V8 engine. Deliveries of the new Flying Spur V8 will begin this spring. Meanwhile Bentley has also launched an uprated version of the GT Speed. Powered by the immense 6.0-litre W12 engine, power is boosted even more, up to 635PS and a record 820Nm of torque. The top speed is now 206mph for the coupe version and 203mph in the GTC. There are styling revisions too with red-painted brake calipers and a chrome Speed on the front wings while inside there is a new colour split reserved exclusively for the Speed models.